Why Does American-Made Clothing Cost More? Two images: The difference is glaring. Have you ever heard that? Or said that? Most of us do want to support local brands. We want to keep our money local, create jobs, and support transparency. But often, it seems to come at a steeper price. Why do responsible choices cost so much? Let’s take a look at the world’s most popular garment: the t-shirt. 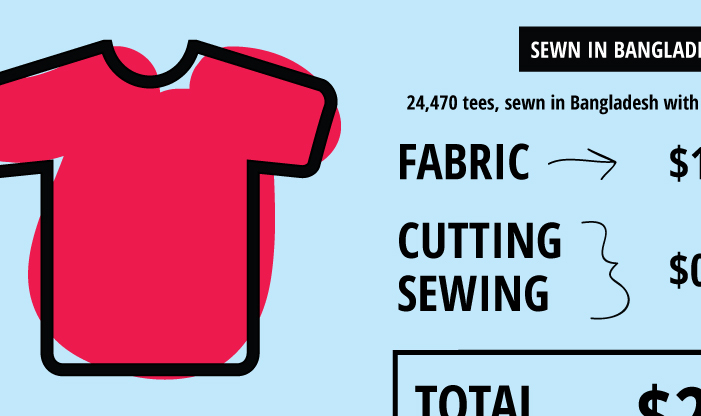 NPR’s Planet Money recently made 24,470 t-shirts during their Planet Money T-shirt Project. They told the story of how their tees were made, from interviews with cotton farmers to the women sewing the actual shirts. The Planet Money tee is one data point of overseas production. But what do things look like on the other end of the spectrum, back here in America? 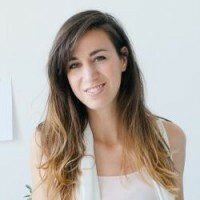 I’m a small, indie designer using a hyper-localized process and USA-based manufacturing. My last production run of t-shirts was 165 pieces. I buy surplus fabric (excess and leftovers from other companies) and work with a cut-and-sew shop thirty minutes from my house. I am the polar opposite of Jockey. The reason why virtually all garment manufacturing has moved overseas in the last 50 years is oh-so-obvious when you take a look at the numbers: even if I were producing thousands of t-shirts, my labor costs could never, ever be as low as $0.50. Bangladesh’s minimum wage just rose from $39 per month to $68 per month. The factory that Planet Money worked with paid workers $80 per month. 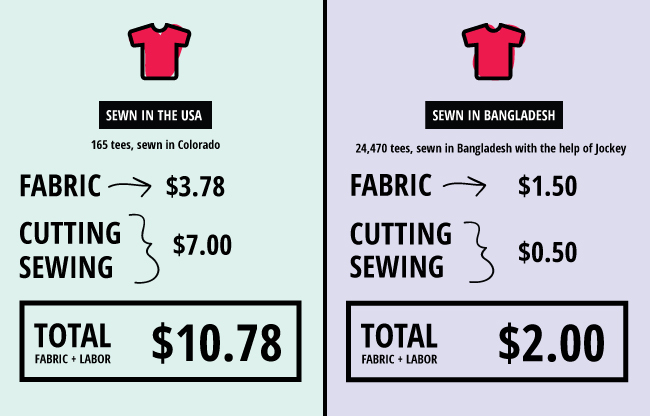 The seamstress who sewed my tees makes between $15 – 20 per hour, depending on the project. This is the reality of pricey American-made clothing. Most indie designers aren’t much different from me, making smaller quantities at higher costs. Tack on other expenses (packaging, shipping, design, sampling), add margins for wholesale and retail, and voila: USA-made isn’t cheap (and shouldn’t be). Your favorite local designers certainly aren’t dragging bags of money to the bank. The next time you find yourself browsing through a rack of clothing, no matter where it came from, think about the numbers. While higher prices don’t always mean better ethics, consider this: What has to happen in order for a t-shirt to cost only $5, $10, or $15 in the store? Can you support that answer? Kristin, I absolutely love how you put this. We're one of the few girls fashion brands that manufactures in America. (We're proudly Made in Los Angeles.) And yes, labor and materials cost significantly more. We make up for it by using higher quality stitching (4 thread overlock) and providing excellent customer service. I think we, as a nation, have grown spoiled by cheap, foreign made garments. Entire department store chains now sell "disposable clothing." We know it's poorly made, so when it falls apart, we'll just throw it away and buy a new one. It's so wasteful! What does this teach our children, and what is the legacy that we're leaving this planet? Many people only judge a garment on price. Part of the problem is, the average person doesn't understand the difference between poorly made garment and well constructed garments. So we need to educate people. I believe people are willing to spend more money if they know why something is better. They just want to be assured of it's value. Kia and Ferrari are both automobiles. They'll both get you from A to B. But one is clearly superior to the other, so no one would ever expect to buy a Ferrari at a Kia price. We, as clothing manufacturers, need to do a better job explaining this to the public. Kristin, your article goes a long way towards doing that. Thank you! Kristin, thank you for speaking about this! I too am a designer of a small organic baby clothing business…we have kept to our beliefs of using all american goods…and its been tough, but we do keep it going! It means a lot to a lot of folks, but some still dont understand why it cost more…being organic cotton and made in the USA ! I truly wish more manufacturing could come back to the US…but in the meantime it is about educating the consumers and perhaps the next generation – our kids…that it isnt always about finding the cheapest item…look at where it is made, and how it gets here, how people are treated, paid, etc. Thanks again!